What Size Back Box do I need? The Glass Light Switches we stock here do require generally a deeper back box. The on/off 2020's and dimmer 2030's require a minimum 35mm deep back box, but we recommend using a 47mm deep back box where possible, as the extra space allows cooler running of the products and helps to lengthen their life. How Difficult is it to install these products? Thankfully, these products require no additional work from a standard light switch and light circuit operation. 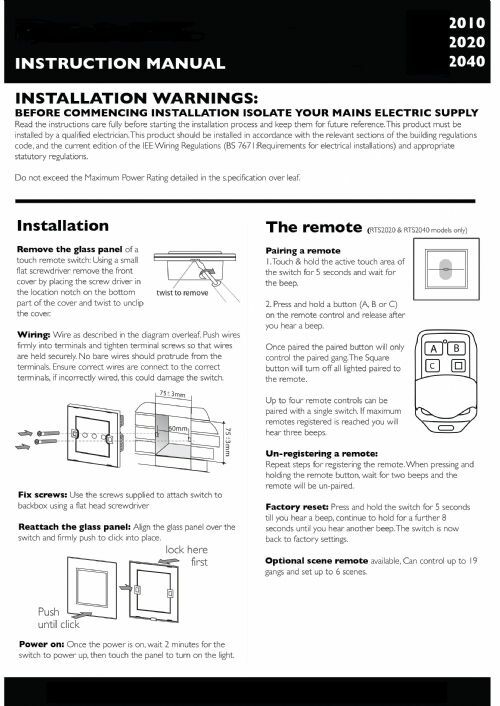 Simply 'plug and play' - take the old switch or socket off and connect these new glass switches. An easy 5 minute job (That should be installed by a qualified electrician) and instantly you have improved your room abiance. From that you now have excellent either remote on/off wireless lighting or remote wireless dimmable lighting that enables various lighting design options in either your home or office, and at a very cost effective price (Both from a product price and installation price perspective). When the light is on, first, press the button on the switch panel which needs to be studied and keep the time 3 seconds. (3 seconds later, the switch will be into the learning state: the light will be from on to off). Then, press the button of the remote and hold on for 2 seconds, the study is done. After finishing the above, you can press the button of the remote which is studied just now to test whether the switch has studied successfully. If the switch is more than one gang, then you can study the other buttons in the same way above. If you want to cancel the button you learned, you just need to study the button again and the original control will disappear automatically. When the light is on, first, press the symbol “+” on the switch panel and hold on for 3 seconds. (3 seconds later, the switch will be into the learning state: the light will be from the brightest to 50% brightness.) Then, press the button “+” of the remote and hold on for 2 seconds, the study is done. When the light is on, first, press the symbol “-” on the switch panel and hold on for 3 seconds. (3 seconds later, the switch will be into the learning state: the light will be from the dimmest to 50% brightness.) Then, press the button “-” of the remote and hold on for 2 seconds, the study is done. You can study the button “ON/OFF” in the same way of the touch switch. When the light is on, first, press the symbol “3min” on the switch panel and hold on for 3 seconds. (3 seconds later, the switch will be into the learning state: the indicator of switch panel will be from on to off.) Then, press the button “3min” of the remote and hold on for 2 seconds, the study is done. The button of “9min” is the same with the learning way of “3min” above. The “ON/OFF” button is the same with the learning way of touch switch. When the power is on, first, press the symbol “OPEN” on the switch panel and hold on for 3 seconds. (3 seconds later, the switch will be into the learning state: the indicator of switch panel will be from on to off.) Then, press the button “OPEN” of the remote and hold on for 2 seconds, the study is done. The other buttons “CLOSE” “STOP” are the same with the learning way of the above.